Samarkind premiere new song 'Fire and Blood' ahead of Inglorious show and debut album. 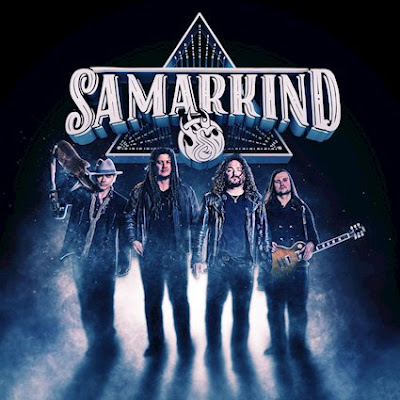 Hard rock blues group SAMARKIND have premiered a new single. 'Fire and Blood' is the second song to be lifted from the band's highly anticipated self-titled debut album, which is released 24th November 2017. This new offering oozes quality and comes just days before Samarkind's special guest slot to INGLORIOUS on their UK-IRE tour, at The Academy, Dublin, on the 4th October. "What started out as a bluesy/rootsy track ended up becoming quite a rocker", comments Samarkind frontman David Paul Byrne, "'Fire and Blood' is interspersed with a lot of light and shade, with a beautiful picking riff added to a killer guitar solo. Vocally it is angry, as the lyrics comment on a lot of peoples general apathy... as in some people just simply can't be pleased no matter what you do. We feel its one of the bigger tracks on the album." 'Fire and Blood', as well as the other tracks from Samarkind's forthcoming debut album, was recorded at Westland Studio in Dublin with producer Alwyn Walker. Samarkind, which features charismatic Irish frontman David Paul Byrne (formally teenage wunderkind singer for successful hard rock band Assassin - a time that saw him tour with Def Leppard, Status Quo, WASP, Manowar and more - and featured vocalist on 80's cult movie 'Trick Or Treat' starring Ozzy Osbourne and Gene Simmons), showcase sublime vocals which are accompanied by the talents of sensational Polish guitarist Michal Kulbaka, Ireland's Mark Dempsey on bass guitar, and South African born drummer Marius Appelgryn.